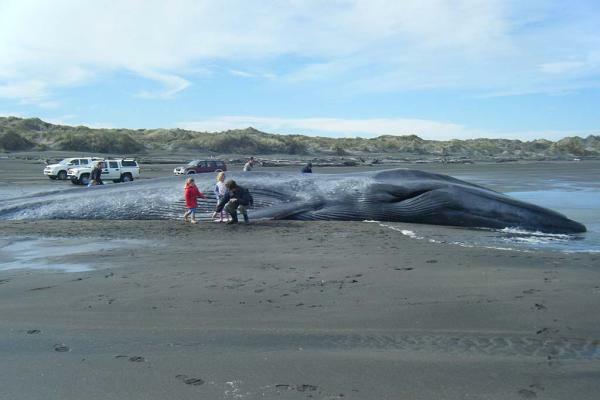 A dead rare blue whale was discovered by locals near Whangaui Beach, south of Waitotara. The 22.5 meter whale was already dead when it washed ashore, said the Conservation Department. The whale weighed in somewhere between 60 and 80 tonnes, and seemed to be completely emaciated. “It has clearly suffered pretty badly. You can see that the ridge of the back caves away on each side … it certainly hasn’t been feeding. Particularly at this time of year, after they’ve been feeding over summer down in the Southern Ocean, they should be at their fattest,” said Anton van Helden, collection manager of marine mammals at Te Papa. What may have happened, was that the whale was caught in netting or a rope, and unable to move.